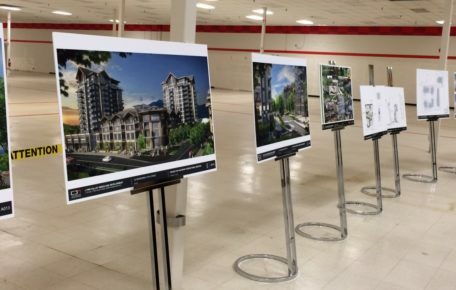 After years of extensive public consultation and study, in the end it took North Vancouver District’s seven councillors less than an hour to unanimously approve four bylaws that will allow Bosa Development’s Lynn Valley Mall development to proceed. 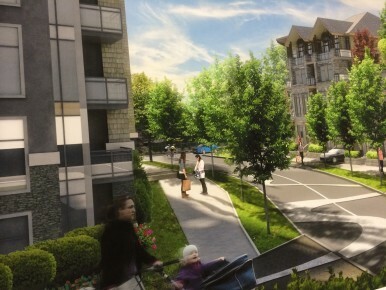 A special council meeting was held on the evening of Tuesday, June 10 with only one order of business: to vote for or against the redevelopment project, which includes a complete overhaul of the mall, mixed residential-retail usage, two 12-storey buildings, a new High Street connecting Lynn Valley Road and 27th Street, and a variety of public amenities. The sun is out, and your garden needs you! Here are some warm-weather tips from Matt and Rob Boyd of Endless Summer landscapers, with some especially good advice about watering plants properly! These are just a few gardening tips for you to consider here in late May/June. Many people seem to think that just because all the plants have been put into their places for the summer and your perennials are blooming, or past bloom, there is no more work to be done. The garden is full of multi-colored flowers, so there must be little or nothing to do. Right? No, there is always work that may be done. 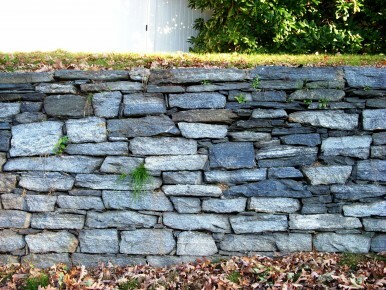 Got a wall? Here’s a workout! This just in from D’Alton McCarthy, the local trainer behind Body by D’Alt. SEDENTARY ? NO TIME TO EXERCISE ? DON’T ENJOY THE GYM? 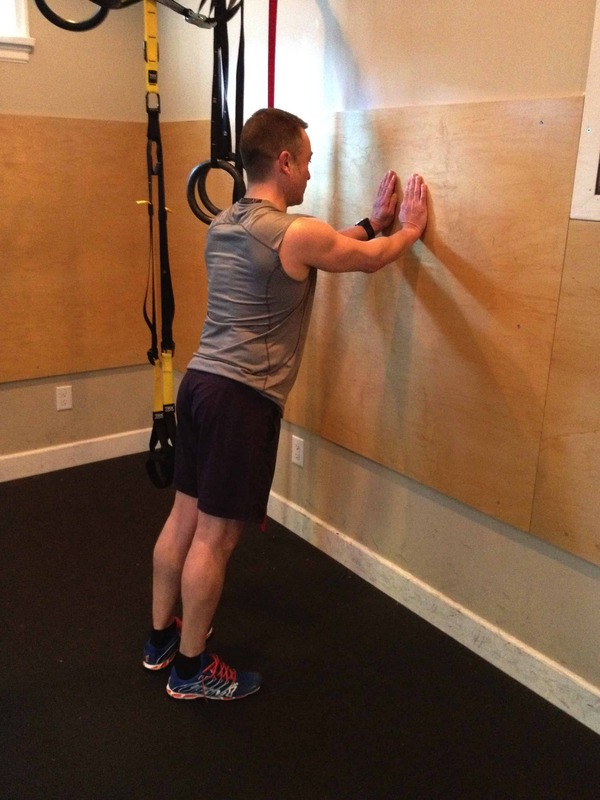 These two exercises, used on a wall, can give you a great and safe work out in under five minutes – one that’s good for beginners, but gives more fit folks a challenge, too. If you are a healthy beginner, start with a five-second invisible chair (also known as a chair sit) followed by a wall push up. I have included pictures of the correct form and optimum positioning. Here’s the advanced position – beginners can choose a more shallow squat. 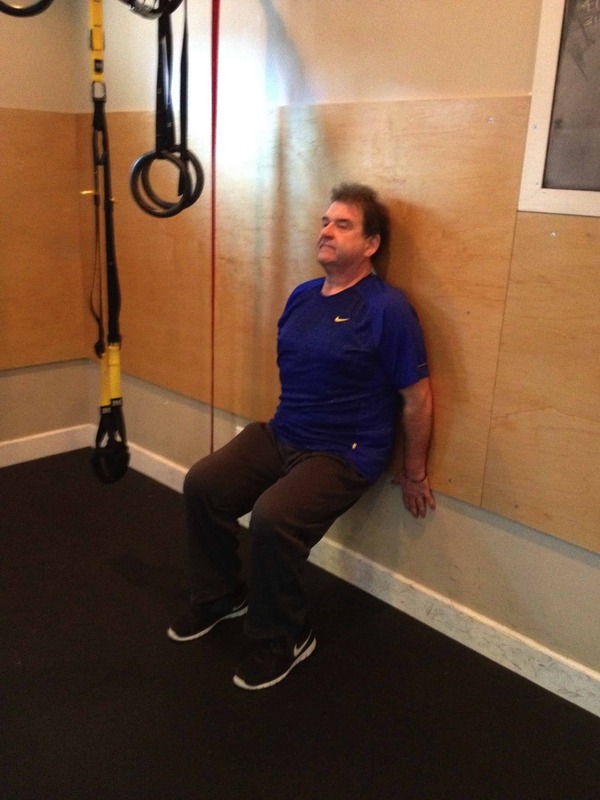 Follow this up with a 10-second invisible chair and two wall push ups…then a 15-second chair sit and three wall push ups…then a 20-second chair sit and four wall push ups …then a 25-second chair sit and five wall push ups, ending with a 30-second chair sit and six wall push ups. 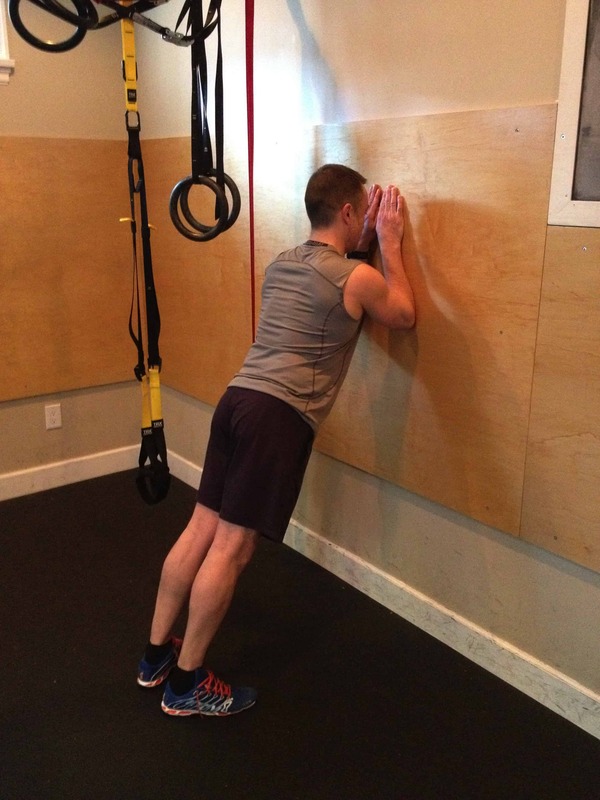 Starting position for wall push up. Slowly move towards wall, then return to start position. If you are new to exercise, start with the first three to four rounds. The most important thing to remember is that you are better off doing less with proper form than doing too much with bad form. In the following month add one more round, or opt for the more challenging position. The rezoning proposal for the Bosa development (1175 Lynn Valley Road and 1280 East 27th Street) received first reading at Council on Monday, March 24, 2014. The development proposal has been referred to Public Hearing, which is the community’s formal opportunity to provide input to Council. The Public Hearing will be held on April 15, 2014 at 6 pm at District Hall. The Agenda for the Council Meeting, including the Report to Council and attached bylaws, is available for review (Agenda Item 9.1) by clicking here [scroll to page 47]. For further information on the Development Application, click here. Where tree or shrub branches have been damaged by cold, snow, and wind, prune back to live stems; use a handsaw for any that are larger than half an inch in diameter. Shaping hedges with hand pruners, rather than electric shears, prevents a thick outer layer of growth that prohibits sunlight and air from reaching the shrub’s center. Prune summer-flowering shrubs, such as Rose of Sharon, before buds swell, but wait to prune spring bloomers, like forsythia, until after they flower. Prune flowering perennials to a height of four to five inches, and ornamental grasses to two to three inches to allow new growth to shoot up. Dig up perennials, such as daylilies and hostas, to thin crowded beds; divide them, leaving at least three stems per clump, and transplant them to fill in sparse areas. Cut back winter-damaged rose canes to one inch below the blackened area. On climbers, keep younger green canes and remove older woody ones; neaten them up by bending the canes horizontally and tipping the buds downward. Use jute twine or gentle Velcro fasteners to hold the canes in place. 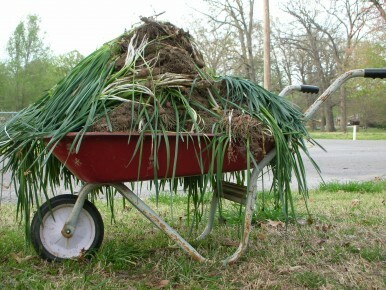 Rake out fallen leaves and dead foliage (which can smother plants and foster disease), pull up spent annuals, and toss in a wheelbarrow with other organic yard waste. Now is a good time to spread a pelletized fertilizer tailored to existing plantings on the soil’s surface so that spring rains can carry it to the roots. Add a 5-10-10 fertilizer around bulbs as soon as they flower to maximize bloom time and feed next season’s growth. Use pins to fasten drip irrigation lines that have come loose and a square-head shovel to give beds a clean edge and keep turf grass from growing into them. Dump collected leaves, cuttings, spent foliage, and last season’s mulch into your compost pile. Shred leaves and chip branches larger than half an inch in diameter to accelerate decomposition, or add a bagged compost starter to the pile. Keep the pile as moist as a wrung-out sponge, and aerate it with a pitchfork every two weeks. Just don’t add any early spring weeds that have gone to seed—they might not cook completely and could sprout. Spring is a good time to test the soil’s pH so that you can assemble the right amendments. Remove turf damaged by salt, plows, or disease to prepare for the seeding that should follow in a few weeks. Work in a ½-inch layer of compost to keep the new seed moist, increasing the germination rate. Begin seeding once forsythia starts blooming in your area. In warmer climates, April is a good time to add the first dose of fertilizer. Remove dead turf with a square metal rake, then flip it over to spread turf soil. Rake escaped gravel back into aggregate walkways and patios, and order more gravel to spread in large depressions, which often form near the driveway’s apron. Refill joints between flagstones by sweeping in new sand or stone dust; water with a hose to set it, then repeat. If the freeze-thaw cycle has heaved pavers out of place, remove them and replenish the base material as needed before setting pavers back in. Use a pressure washer with a low pressure tip to remove slippery algae spots or leaf stains from patios and walkways. Remove badly rotted or damaged pickets, boards, or lattice, then scrub wood structures clean with a mix of two gallons water, two quarts bleach, and one cup liquid soap; let dry. Patch rotted sections with wood epoxy; install new wood as needed. 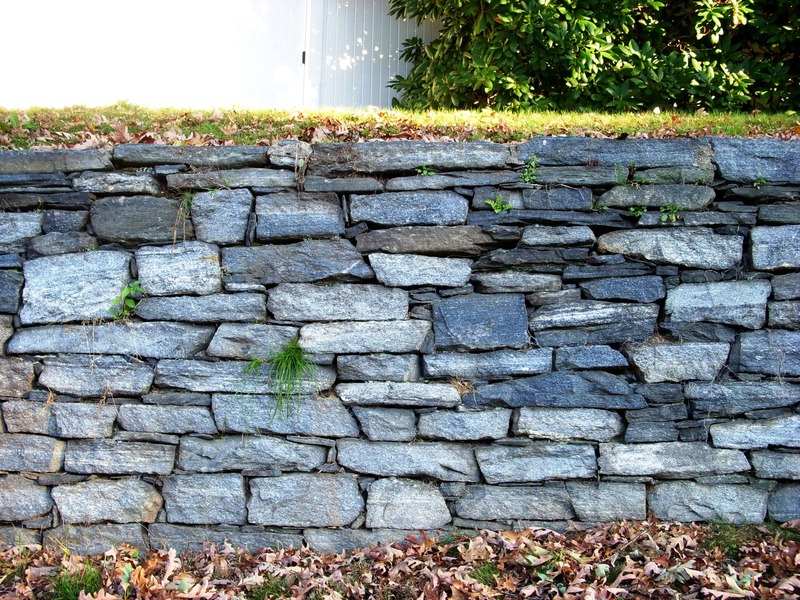 Check wobbly fence posts to see if they need replacing. Scrape off old paint, then sand wood all over with 60 grit to prep for a new finish coat, brush on a new coat of paint or stain. 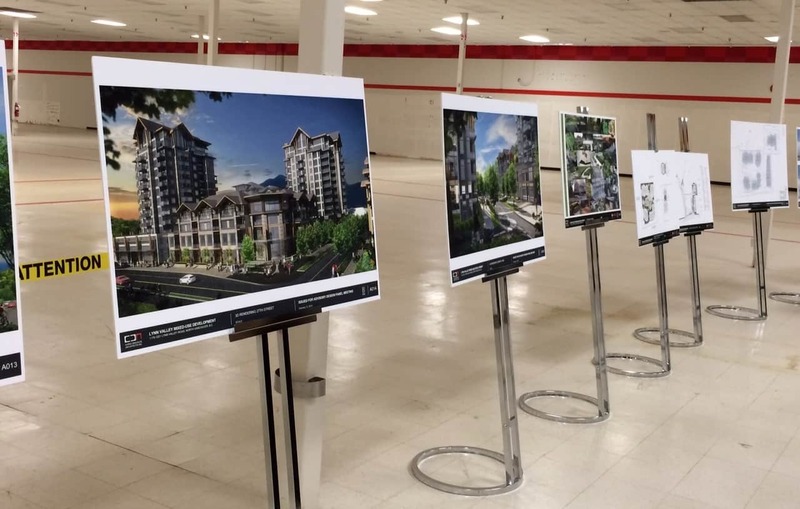 Four hundred chairs had been set out, but they proved unequal to the task of seating the overflow crowd of residents who came out Wednesday night to learn more about the Bosa Developments proposal for the transformation of Lynn Valley Mall. Knowing that traffic is a big issue for those people concerned about increased densification in Lynn Valley, for example, Sager announced that Bosa Developments has offered to finance the addition of an extra lane at the entrance to the Trans-Canada Highway, at the highway overpass marking the end of Lynn Valley Road, a proposed improvement that has been met with enthusiasm by all levels of government involved. The audience question-and-answer period that followed Sager’s presentation took place under the direction of Catherine Rockandel, an independent, third-party facilitator who described her role as ensuring that all voices were heard in an environment of “respect and civil conversation.” She noted that all comments coming from the floor would be recorded and included in her report to North Vancouver District Council – though at least two council members were spotted in the audience, taking in the evening for themselves. Comments from the floor were very largely positive, with even those opposed to increased density in Lynn Valley tipping their hat to Bosa Developments for the compromises they have made in response to community feedback. Glenn MacKenzie, one of the founders of the “Stop Hirises” campaign in Lynn Valley, called Bosa “a great developer”, and focussed his criticism not on the plans themselves, but on the whole issue of densification in Lynn Valley. While it is not uncommon for older, well-established residents to resist change in their neighbourhoods, many of the people speaking in favour of the proposal have in fact lived in Lynn Valley for decades. 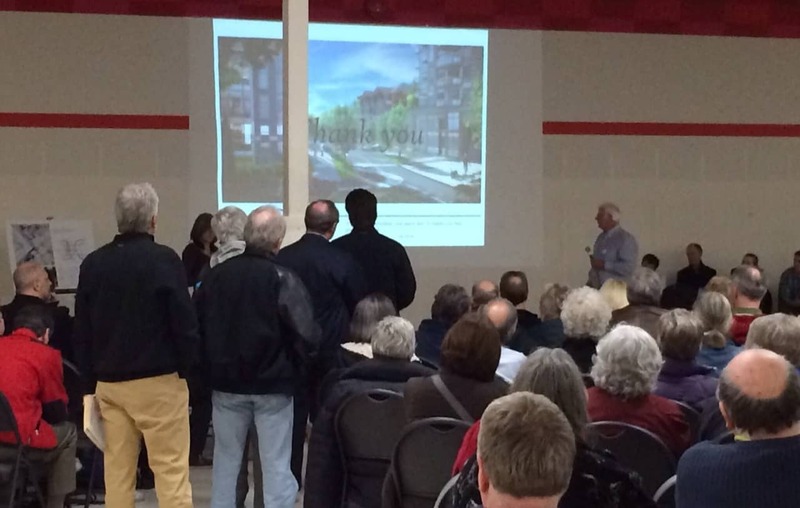 They pointed to increased community amenities, options for downsizing their housing, and the walkability of the Bosa redevelopment as attractive features of the proposal. A resident of Craftsman Estates, who lives across the street from the mall and would be directly affected by the construction plans, also spoke in favour of the development. “I’m thoroughly impressed with the Mountain Village look and the willingness of Bosa to work with the community,” said Hazel Boyd, noting that the mall should offer a more robust business environment and that the District of North Vancouver needs more of a tax base to ensure future economic health. If you haven’t yet had a look at the plans and drawings for the proposal, visit the Bosa storefront in the mall in the former pet store space, or click here. Your feedback can be sent directly to Mark Sager by clicking the orange tab at the left of the screen on his Lynn Valley Connect site. On February 13, the District of North Vancouver’s Advisory Design Panel unanimously passed a motion of recommendation to the District Council in support of the proposed re-zoning. Public input will be taken at the public hearing stage, should the application proceed. 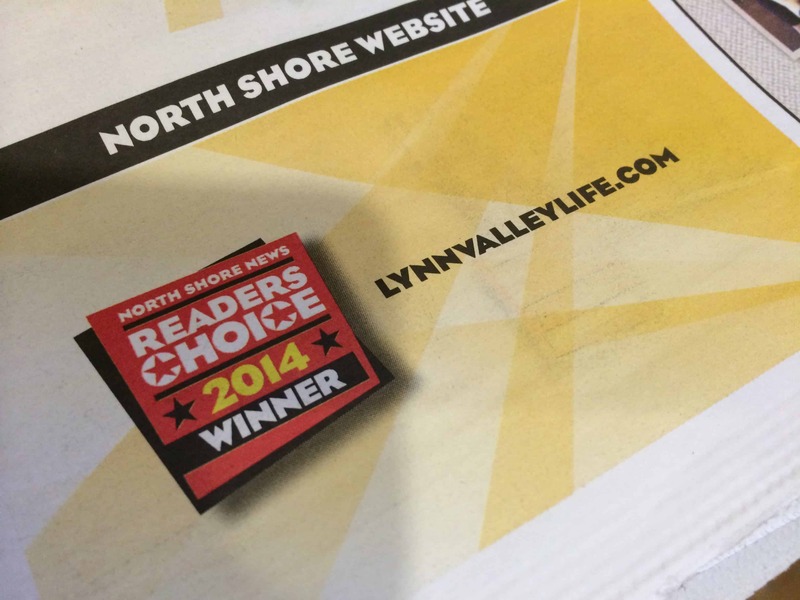 Coming to you from the blowing-one’s-own-horn desk is the happy news that LynnValleyLife.com was once again voted the North Shore’s Best Website in the North Shore News Readers’ Choice Awards for 2014. As you can imagine, we are immensely grateful for this show of support from our website followers. 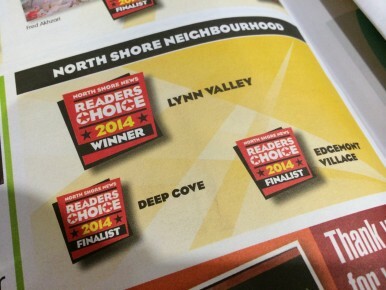 Even better, though, we are delighted to note that Lynn Valley was voted the North Shore’s Best Neighbourhood! We know how many local people work to make this community the friendly, neighbourly place it is, so this recognition is a big tip of the hat to all of them! And a big shout-out, too, to the Black Bear Neighbourhood Pub, which has won top place in its category every year since it opened its doors in 1997! Other Lynn Valley businesses and landmarks showed strongly in this year’s Reader’s Choice Award, which consisted of votes from a record-breaking 5,000 North Shore residents. Many congratulations to them all. We have listed them below, along with the links to their Merchant Profile on LynnValleyLife. This is a good chance to remind our readers that our profiles are a fun way for local residents to get to know our retailers better, so if you know one who isn’t represented on our site, do encourage them to contact us to take advantage of this free opportunity! When life gives you lemons, the optimistic make lemonade. So when Dana Kovanda and her son find broken glass in Hastings Creek, they don’t just pick it up – they make beautiful jewellery that’s unique to this neighbourhood. Dana’s tumbled-glass jewellery – like beach glass, but tumbled via machine instead of waves – has just been introduced at the End of the Line store, where owner Connie Fay is confident it will be popular with neighbourhood residents and visitors alike. The silver-wrapped green, clear, amber and blue pendants and earrings aren’t just lovely to look at, Connie thinks that some Lynn Valleyites of her generation will also get a kick wondering if the glass shard might be a remnant of one of their own evenings of youthful excess. 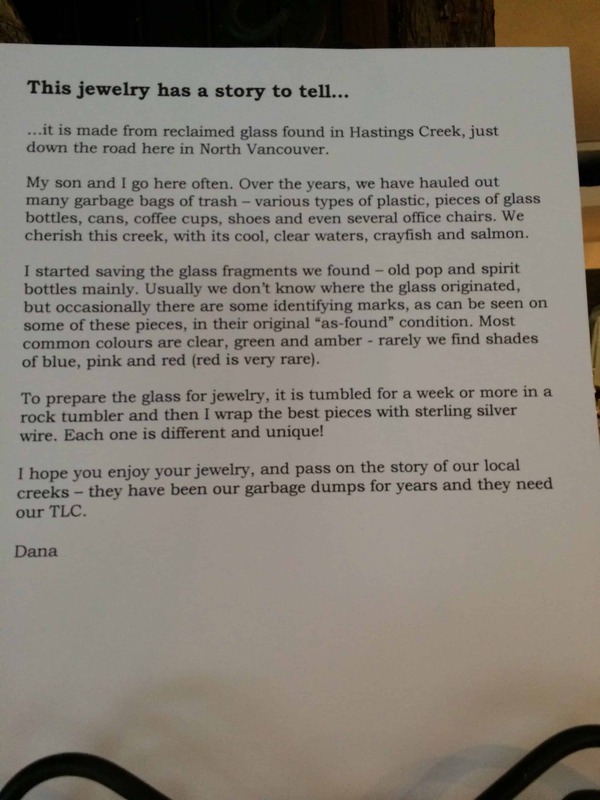 While the glass jewellery might evoke fond memories, the garbage that Dana and her son collect from the banks of Hastings Creek is a less romantic testament to human activity around the fish-bearing waterway. According to her sign posted by display case, glass isn’t the only thing they find – unfortunately, it’s not too unusual for them to have to haul out items as large as office chairs. 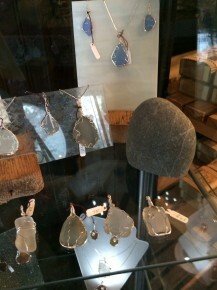 The family passion for environmental stewardship has found a lovely expression in this Hastings Creek line of jewellery, so have a look while you’re at the End of the Line. 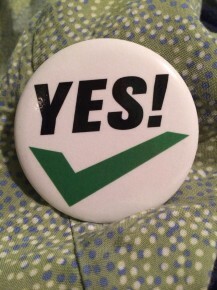 If you’d like to clean up your own neck of the woods, consider North Van District’s Adopt-a-Street program (bottle cap cufflinks may be the next big thing!). If you’d like to learn more about the interesting history of Hastings Creek, read this watershed profile. And if you’d like to learn more about local creeks and their protection, check out the fine work of the North Shore Streamkeepers. And if you’d like to know more about Dana’s jewellery, you can contact her at sunflower4you2@gmail.com! What could possibly be better than LynnValleyLife, your neighbourhood news source? That’s easy – LynnValleyLife 2.0, coming your way later this month. We’re excited to be unveiling some major changes that will make the LVL experience even more user-friendly. We know that readers often visit our website when they’re on the go, whether it’s to check out the details of a community event listing or the address of an open house. So we asked the good folks at SplitMango (a web development agency headed by Lynn Valley’s David Miller) to build us a site that is “mobile responsive.” That means that regardless of what device you are using when you visit LynnValleyLife.com, the content will present itself in the most reader-friendly way. No more squinting and “zooming in” required! We’re also introducing a bulletin board forum that will allow Lynn Valley residents to talk directly to each other. We know that if you’re selling household treasures, looking for a babysitter or hunting for a lost dog, it’s the people down the street you want to reach, not the citizens of Port Coquitlam or Richmond. We’ve really been looking forward to launching this “classified ads” section – because who doesn’t love a little buying, selling, and swapping, especially when you can shop local? Another upgrade will be a re-organized Merchant Profile section that will make it easier to search out the shops and services you need. So if you operate a business here in Lynn Valley and haven’t yet gotten on board, now’s the time. Just contact us at info@LynnValleyLife.com and we’ll send you all the info you need to have your own page in our business section – for free! It’s thanks to readers like you that LynnValleyLife is able to help local businesses, individuals and non-profits spread the word at no charge. We’re able to stay ad-free because our site is sponsored by Jim Lanctot and Kelly Gardiner, the top two RE/MAX realtors in Lynn Valley,* so your continued word-of-mouth referrals and real estate business will keep LynnValleyLife thriving well into the future. But don’t just sign on with Jim and Kelly because you love your neighbourhood news website – take a look at what previous clients have said about their work. You can be confident you’re making a great choice when you go with the LynnValleyLife team! (*based on MLS sales in Lynn Valley, Braemar, Tempe, Westynn, Westlynn Terrace & Princess Park between 01/01/13 – 10/15/13). The Fitness Well – a public fitness studio within the North Shore Winter Club – is opening on January 13, just in time to help Lynn Valleyites with their New Year’s Resolutions. Up to three classes may be taken for free during the week of January 13 to 18; after that, classes can be taken in eight-week sessions. The schedule of classes can be found here. LynnValleyLife caught up with Fitness Consultant Justine Simmons as she was in the final countdown to get the Fitness Well open for business. Here’s what she had to say about North Van’s newest fitness facility. What is The Fitness Well, in a nutshell? The Fitness Well is a brand new fitness studio based in the North Shore Winter Club. We offer yoga, pilates, Zumba® and dance to all ages including family classes. Do you have to be a member of the North Shore Winter Club to join The Fitness Well (FW)? No. Both members of the NSWC and the public can register for classes at the FW, although the FW is owned and managed by the NSWC. What’s your background in the fitness biz? I have been a personal trainer and fitness instructor for over 10 years. I have specialised in yoga for the last five. Before that I competed in international level skiing. 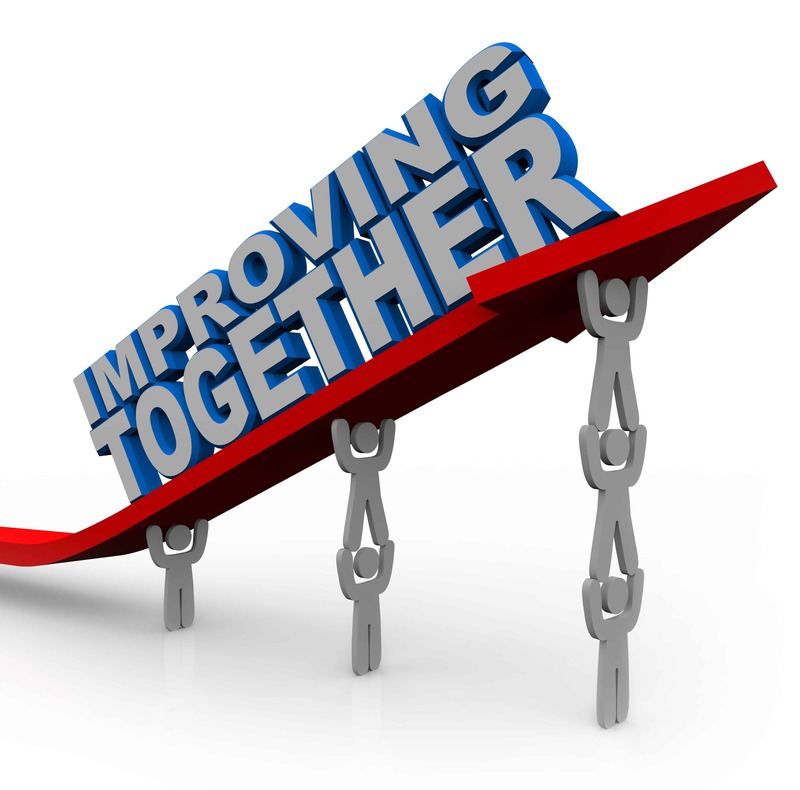 What prompted the NSWC to open up The Fitness Well? The NSWC was lacking in non-“sports” fitness. They have very active tennis, hockey and curling programs, but not a lot aimed at women and girls, nor people who enjoy non-competitive fitness. We hope the studio will be an inviting space for females mostly, but men are encouraged to join in as well. What do you think FW clients will most appreciate about your facility? I think they will appreciate the convenient location and free parking, the variety of classes for all ages, and the hand-selected instructors. What’s ‘different’ about the The Fitness Well? We’re the only public studio within a private club setting. It is a little exclusive, but not excluding, if that makes sense! Do you have a target market for whom you think the FW would be a great fit? Locals will enjoy the accessibility of the location, and we expect mostly local women and girls of all ages. We have surveyed our female members in detail and hope we are offering the classes, times and levels that they are looking for. That said, we also offer classes such as “strength and stretch” which are provide a great balances for hockey players and other athletes who need to minimise injury and protect their joints and muscles. What words of encouragement/advice do you have for fitness newbies embarking on a healthier 2014? Sign up with a friend, it makes it easier not to back out. You will look forward to seeing your friend even if you don’t feel like working out. Also, try out our free classes in our January opening week – there is no excuse not to! Thanks, Justine! Anything else you’d like to add? Those who have never been to the North Shore Winter Club may like to take a tour of the facility when they stop in. They may be surprised at how enormous the Club is, and what a great family environment is provides. Please speak to the front desk for more info and to sign up for the free classes: 604-985-4135.